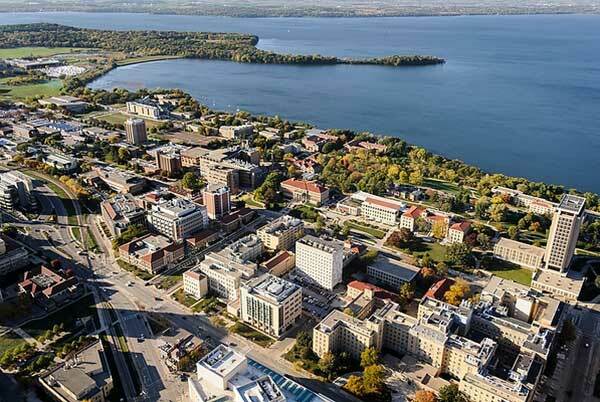 The central and lakeshore residential area of the University of Wisconsin-Madison campus is pictured in an autumnal aerial view. At top is Lake Mendota and Picnic Point. Prominent campus buildings include, from left to right, the Wisconsin Energy Institute, the HF DeLuca Biochemical Sciences Complex, Microbial Sciences, Bock Laboratories, Genetics-Biotechnology Center Building, Agricultural Hall, Nancy Nicholas Hall, McArdle Cancer Research Building, Van Hise Hall and the Medical Sciences Center. The photograph was made from a helicopter looking northwest.